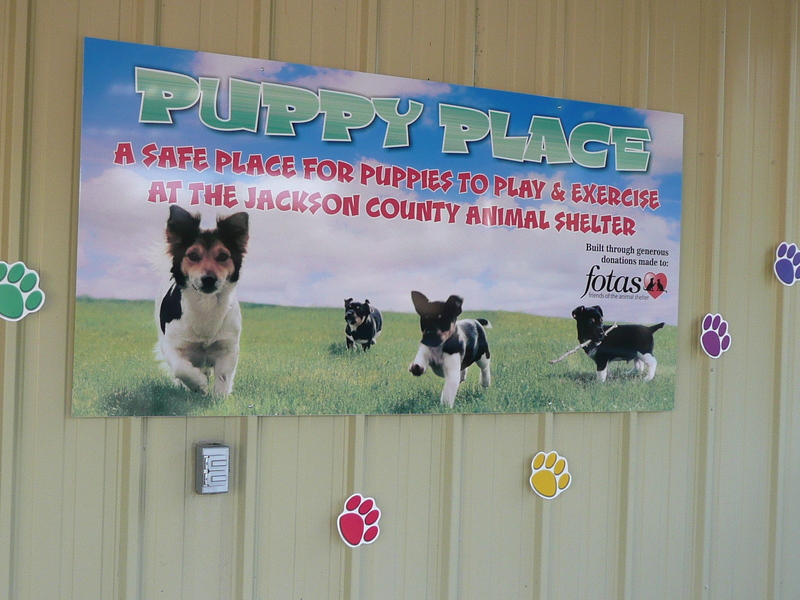 Friends of the Animal Shelter (FOTAS) is a non-profit volunteer organization that was formed in 1990 to support the programs of the Jackson County Animal Shelter. FOTAS has 501(c)(3) status with the IRS. Cash donations to FOTAS are 100% tax-deductible, and all donors will be mailed a tax receipt. Physical Items: You may ask for a donation receipt for physical items when you drop them off at the Shelter, which may not be 100% tax deductible. Check with your tax consultant for advice. Signing up for on-line shopping with the companies listed below earns money for us, without it costing you a penny! Making one-time and recurring gifts by credit card is easy and secure through DONATE NOW. Just click on the orange DONATE NOW button below to use your VISA, MasterCard, or American Express card. The Jackson County Animal Shelter is the ONLY open-door shelter in Jackson County that takes “all comers”. No matter what condition the animal is in when it comes through the door – surrendered, found, abandoned – the Shelter will try and save the animal and find them loving, permanent homes. Because the Shelter receives very limited funding from the Jackson County’s General Fund, support by donating to FOTAS continues to be more and more important. More than 250 volunteers socialize and enrich the lives of pets at the Shelter that are waiting for their fur-ever homes. Subsidizing the adoption fees of older and special needs animals, both cats and dogs. Ensuring that all animals are tested for communicable diseases by contributing to the Shelter’s medical expenses. Paying for medical treatment for animals with injuries or curable diseases that might otherwise be euthanized. Providing “a home between homes” though the Foster Program (we need you!). Maintaining and improving the Agility Yards and Slim Jim Lane where we exercise, socialize and train dogs. Paying for in-Shelter training for large-breed dogs, or those with behavioral issues, to help them become more adoptable. Paying for 1-hour in-home professional training within 6 months of adoption. 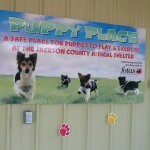 Puppy Place – a safe and secure place for puppies to be socialized and exercised. Kitty Korner – an indoor/outdoor cattery that encourages cats to learn to live peacefully with other felines, and enjoy fresh air and exercise. We have also greatly enhanced and expanded the Agility Yards. FOTAS also supports the efforts of SPAY/NEUTER YOUR PET (SNYP) by contributing funds for their annual campaigns. In 2018, SNYP will be joining forces with us, which will give them a larger volunteer base, as well as more funding. Do you know people who have everything and are very difficult to acknowledge on special occasions? A donation to FOTAS in someone’s name is a very meaningful gift acknowledging his or her love of animals. FOTAS will send a handwritten thank you card to the recipient of your gift in his or her name. Please include the name and address to whom the thank-you card should be sent. Memorial donations establish a legacy of love in memory of a person or pet. The names of those remembered will be listed in our newsletter, The Scoop. FOTAS will also send a handwritten tribute card to the person or family you wish to honor. Please tell us the name of the person or pet you wish to honor and the name and address to whom the tribute card should be sent. Amazon has introduced AmazonSmile, a simple and automatic way for you to support FOTAS every time you shop, at no cost to you. When you shop at smile.amazon.com, you’ll find the exact same low prices, vast selection and convenient shopping experience as Amazon.com, with the added bonus that Amazon will donate .05% of the purchase price to FOTAS. To shop at AmazonSmile, simply go to www.smile.amazon.com from the web browser on your computer or mobile device. On your first visit to AmazonSmile, you need to select Friends of the Animal Shelter to receive donations from eligible purchases before you begin shopping. The system will remember your selection, and then every eligible purchase you make on AmazonSmile will result in a donation. You’ll always need to start from smile.amazon.com when making purchases for FOTAS to receive a donation. Sign up for the Community Rewards program by linking your Fred Meyer Rewards Card to FOTAS at fredmeyer.com/communityrewards. You can search for us by our non-profit # 80864. Then, every time you shop and use your Rewards Card, you are helping FOTAS earn a donation (4% of your purchase)! Every time you shop at any of the 1,700+ online stores in the iGive network, a portion of the money you spend benefits Friends of the Animal Shelter (Southern Oregon) – up to 26% dependent upon retailer. It’s a free service, and you’ll never pay more when you reach a store through iGive. In fact, smart shoppers will enjoy iGive’s repository of coupons, free shipping deals, and sales. Many online pet retailers are part of the iGive network too. To get started, just create your free iGive account by clicking here. Publicly traded securities, such as stocks and bonds, can be donated to FOTAS through a transfer of the securities. This type of donation offers you an excellent opportunity for a tax deduction. The transfer of appreciated stocks may enable you to avoid the capital gains taxes you may be liable for if you sold the stocks. Please consult your attorney or financial planner if you wish to make such a gift. Real estate donations such as a farm, vacation home, residence, unimproved land, or commercial property can help us immensely. Such a donation may provide you with significant tax advantages, such as avoiding capital gains tax that would be due if the property were sold. It is the policy of FOTAS to sell such properties and use the proceeds to further our mission of helping save homeless pets in Jackson County. A qualified appraisal of the property is required before the gift is made. Please consult your attorney or financial planner if you wish to make such a gift. Click here to go to our Legacy Society page.